Last week I Skyped with a class at the Notre Dame Academy in Park Hills, Kentucky, that read WHERE AM I WEARING? I’m always happy to Skype with classes reading one of my books. I often do these Q&A sessions for $0, but payment comes in many forms. Last night after returning from two days in Ferguson seeding a Facing Project, a package from the class was waiting on me. There were pajamas for the kids because I shared that each night after bath I have Harper check the made in label on her pajamas. 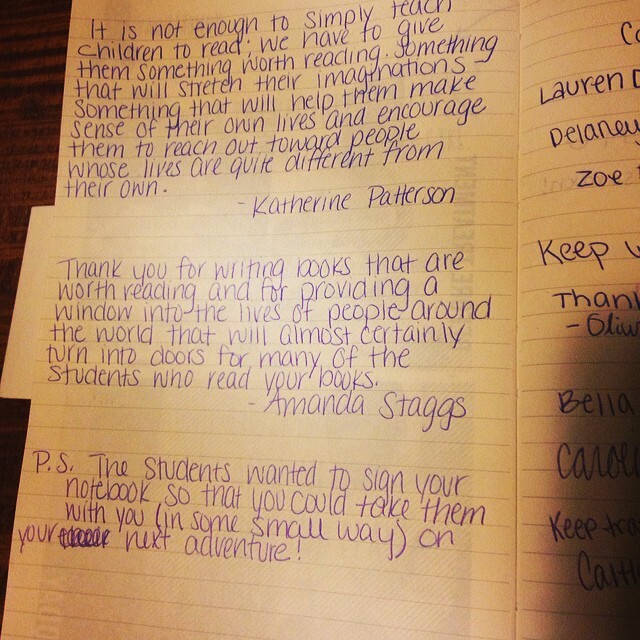 There was a moleskine with an awesome quote followed by a message from Amanda Staggs, the class’s teacher. “It’s my birthday!” Harper announced in our bedroom at 2 AM. But I’m younger now than I was before she arrived. I read children’s books about talking animals and magic. We’re also making our way through the Harry Potter series. I color, still not very well. There is something really meditative about it. We pick on Annie together. We crack toot jokes more than we should. We play hide and seek and tag. We go on bike rides. We sing duets from Frozen.